Have hot pepper in your eye? Grab milk (preferably whole milk) and splash it into your eye. Aaahhh blessed relief. Then come back and read my story. First I would just like to say that the number one remedy for bringing relief to the pain of hot pepper in your eye is simply to wear gloves while cutting peppers and NEVER EVER TOUCH YOUR EYE after cutting them. However, since I was not quite so smart last Friday, I had to come up with another remedy. I got all the peppers cut up and put away, cleaned up my mess and washed my hands. I then proceeded to help get the boys ready to head out the door for PE. My eye was itchy…and so I scratched it. As if someone had lit a match on my eyeball I shrieked and turned in a circle (because I didn’t know where to go or what to do). I believe that little move is called the Eyeball Fire Ballet Step. I then ran out of the kitchen and upstairs to Matt, who was thankfully home that morning. Neither of us really knew what to do, but I quickly put a cold, wet washrag on my eye. This brought a small amount of relief, which is good because all four boys (who aren’t used to seeing their mom run screaming out of the kitchen) had made their way upstairs to see if I was still alive. At least I was able to look up at them with one eye and a half smile to give them a little assurance that I was okay. Matt went ahead and loaded up the boys to take them to PE. I decided to stay home and be miserable. The pain was not going away, and was in fact creeping all the way up to my forehead and all the way down to my chin (not kidding), making me feel as though I might pass out. I have a pretty high pain threshold, but wow. With the cold wash rag over my burning eye, I somehow did a swag search on “hot pepper in the eye” to see what I needed to do. Did I need to go to the ER? Could they maybe take off my face so that the intense pain would stop? I finally found a suggestion to use a shot glass full of whole milk to wash the eye, which would neutralize the capsaicin in the peppers that was causing the burning. Whole milk I had, a shot glass…not so much. In the meantime, one of the homeschool moms (who had heard of my woes at PE class) called to say the exact same thing (although she didn’t mention the shot glass). Using one of our little drinking glasses, I was somehow able to get milk into my eye. (Don’t ask me to demonstrate.) I also did a fairly good job of making the milk run all the way down my face and neck, but whatever. I then decided that I should make cookies, both because I deserved and needed a cookie after my trauma…and because I thought that when the boys got home, they might like to see that their mama was normal (relatively speaking) and okay. Kinda brings a new dimension to the idea of milk and cookies bringing comfort, doesn’t it? Wear gloves when you cut hot peppers and don’t touch your eye. But if you don’t and then you do…swish your eye with milk. This post was originally published September 19, 2010. Ouch, Laura ~ But you are so brave to go where no one else wants to go, and live to tell about it! I second the motion for some cookies with your milk! Poor you!!!! My husband also learned this the hard way when he thought he was too manly to wear gloves while cutting hot peppers for his chili. His hands were bright red and burned for at least a day and a half! Good to know the milk in your eye worked…I once made guacamole with jalapenos and neglected to wear gloves. Not only was the guac so hot that my mouth burned for hours, but my lips were burning and my hands were burning for almost a full day! I must have picked a really hot jalapeno! I learned my leason and not only always wear gloves now…bit I also make sure I remove the seeds when I make salsa or guac. This isn’t funny, but I can’t stop laughing. I love that you have such a sense of humor about your daily life. Have a blessed day. Yikes, I’m sorry you peppered your eye :-( You were in good company though…we had friends over on Friday and served chili with fixin’s, one of which my husband decided should be the evil hot peppers we get from our CSA. One couple, who are both extremely mild-mannered and calm people, ended up running around our kitchen panicking because my friend’s mouth was burning and her husband got some in his eye. Too bad we only drink skim milk around here…some whole milk would’ve come in handy! I felt kinda terrible for torturing our guests! I feel your pain. About a month ago, I was putting up dilly beans. I accidently put a full teaspoon of cayenne in a jar on top of the beans instead of 1/4. Well, stupid me decided to blow the extra into the sink. This plan backfired, literally! Cayenne up the nose in the mouth in the eyes. I spent the next half hour with my head in the sink with cold water running on it. Hopefully I learned my lesson, but if I didn’t I’ll have to remember the milk trick. Thanks! Ooooh, that is a sad story!! I really want to know if the cookies came out alright, or did they taste like peppers? I cut jalepenos the other day, with gloves on, but the gloves got holes in them. I switched to another pair, which worked wonderfully to hold the heat they’d already absorbed in! I treated my hands with aloe when I finished. The cookies tasted like chocolate chips and all was right in the world (except that my hands were still on fire!)! I’ve done with jalapeno/rub the eye thing but it wasn’t the hottest pepper in the world, either (luckily). Oh Honey! Glad you’re okay. Alton Brown did the same thing (he’s Food Network celeb in case someone doesnt know him) so you’re in good company. I second the motion to call your opthamologist. Better safe than sorry on that one. Wow, that sounds so horrible! I am surprised, though, that you do not have an eye cup on hand for rinsing out eyes when necessary. I know they still make nice, heavy-duty glass ones because I saw one in CVS the other day. The nice thing about them is that the top is not just round, it is shaped to fit against your eye for easy rinsing. We were always getting dirt or something-or-other (soap! ow!) in our eyes when we were kids and mom would pull out the eye cup to rinse our eyes with water. Wow, that is cool! I use it when my little one has a little gunk in her eye and it works wonders! I did that myself a couple of weeks ago. Ouch! It made me understand why Indian food is always served with a cold salad, or yougurt. Something to minimize the heat! Oh. My. I definitely thought of that when I went to the bathroom…to be SUPER careful. I actually can’t remember if I got any swagbucks for the search…hmmm…I sure SHOULD have!! Suposedly if you get some chili pepper on your hands because you forgot gloves, you can dip your hands in chopped tomatoes and it will neutralize it. Welcome to the club! I have my own pepper burn story I posted a couple of month ago. Another thing that works is Johnson’s baby shampoo, especially for things that are both oily and hot/spicy. There’s something in it that numbs the eye, as well as the soap that breaks up the oils. When I worked as a prison guard, we were sprayed in the eyes with OC (strong pepper spray) during training and occasionally exposed during situations at work, and this is what they used to neutralize it. I have done that once, unfortunately I still had my contacts in. After I touched my eye and it started burning, I knew I had to get my contacts out, but my hands still had pepper all over them. It was horrible trying to get my contacts out with burning hands and burning eyes. I would give your eyes a rest for a couple of days. Ooooh I had mine in too and had to keep from screaming when I took them out!!! They HAD to come out but WOWZA!! Oh goodness! Something like this happened to me as a child. I was helping my mom pick peppers and then I touched my face. I can remember running around the yard yelling “my face is on fire!” I don’t think it was really that bad, but to a child it seemed terrible. Oooooh, so sorry this happened! It happened to me too, once when I was cutting peppers from the farmers market that weren’t supposed to be hot! I guess a hot one got into the wrong bin. I remember wondering, too, if I needed to go to the hospital, but a neighbor/nurse told me that it wasn’t serious!!! And I felt the heat spread all over the inside of my sinuses. Whew! Oooo. Ouch. Yikes. I always seem to do that sort of thing if I’ve been wearing gloves. Eyes, nose, and oh my, I won’t tell you about the feminine hygene product incident! I finally gave up the gloves and am uber-careful. I wash and wash and wash and seem to survive without incident. Ouch! That sounds horribly painful! Milk is a great remedy. I once cut up peppers and thought my hands were clean before taking a shower. Upon washing my face and err, privates, I learned I still had pepper juice on my hands. Didn’t have any fresh milk but reconstituted powdered milk works fine too. In Mexico (where my husband is from) they will run the infected eye with hair. Don’t know if it really works as I have never been through this before, but it’s another idea. Even wearing gloves to cut them up, I’ve had burning hands afterwards. I soak my hands in a bowl of milk. Be careful of LARGE garlic cloves in a garlic press…sometimes they shoot out the side and into your eye also. I coat my hands with a little vegetable oil before cutting peppers. It keeps the pepper from penetrating the skin. Then I wash with Dawn dish soap afterwards. No pepper residue is left. You must be careful handling a knife with oily hands though. Takes some care. I had this exact same thing happen last year. It is horrible! I also had itched my nose so it was all up my nose and in to my sinuses and I had to get a syringe and shoot milk up my nose. It was one of my finer moments! This post had me laughing! :) But only because I feel your pain. My dad must have planted those same peppers a few years ago. And I did the exact same thing! I didn’t touch my eye (thankfully) but my hands were ON FIRE! Milk didn’t help much and I vowed that if I survived I would never cut a pepper without gloves again! Glad the milk worked for you. Milk in the eye will also help for anyone that may swim in a chlorinated pool. When my son was taking swim lessons years ago another mother did the milk thing in her daughter’s eye to soothe. A bit late with this info but it might be useful in the future sometime – if you ever need to put something in your eye again, put it in a tablespoon and then bat your eye in that. I learned this many years ago when my Mom told my cousin to make some warm epsom salt water and put it in a tablespoon and bat her eye in that to get rid of a stye. It worked for her and she was so appreciative. Thanks for sharing your story! I chopped peppers last night for a Thai dish, and after my fiance and I tasted them, I decided they were not so hot after all and TOOK OFF the gloves I was wearing. Fast forward to a few hours later when I attempted to take out my contacts– oh goodness! The dog and fiance alike were treated to a performance of the Eyeball Fire Ballet Step! Your remedy and humor alike are much appreciated! Thank you for this entertaining post! I laughed along with your humorous writing, and it’s another example of how humor (and joy) can be found in any situation! I just found your website today, and the things you write about are exactly the things I’m interested in, so I look forward to reading your posts. Thank you for your instructional posts that are sprinkled with humor and real life! I had to do that last year when I got paprika pepper in my eye. Milk worked like a charm because water was making it worse! Luckily my husband knew exactly what to do, he works in a prison and officers have used milk to help counteract OC spray. I saw your booth at the Nebraska Homeschool conference. Your website is full of lots of useful stuff. Thanks for all of it! Now at least when you are watching COPS on TV and see the bad guys getting pepper sprayed you can relate. Nasty, nasty stuff. Maybe you could put out a video teaching us the Eyeball Fire Ballet Step. I’m sure several would buy it…LOL! Wow! Is about all I can say, living in the SW USA I totally feel your pain and have decided after reading many of the other posts, that I must have a high tolerance to pain in the eye, as I have done this numerous times and have never felt like that, ever! And as not funny as I know this was, you wrote it so I was crying at the end from laughing so hard. Glad you didn’t kill yourself in the process of trying to find out what was going to help though, and it is great to hear that your boys were concerned enough to find out if you were ok too! Just the other day I cut up jalapenos and my hand were burning and seemed to be getting worse. My friend told me to wash my hands with cold milk and sure enough I had instant relief! I was amazed. Oh wow thanks for the tip! We don’t grow any hot peppers…mainly because I’m a wuss. But I love my bell peppers fresh from the garden!! Like 2 peas in a pod. I did the same exact thing a few years ago. I hung my peppers to dry and later took them to the kitchen to crush them. As I was crushing the peppers, I rubbed my eye. WRONG MOVE. All of a sudden I had pain in my eye area that shot up into my forehead and down to my chin. Such pain I have never felt before (well, maybe child birth…) Both eyes swelled shut and no one was home. I just stood there for what seemed like an hour with my face on fire, not believing I had done something so stupid. I knew milk soothes a sunburn, so I made my way into the bathroom and reached in the 2nd drawer down to grab some cotton balls. Then out to the kitchen I go, to get the milk from the frig. Most of the milk went down the sink, but I did manage to get enough on the cotton balls to bring relief to my face. It only lasted a minute or so, and then here it comes again..a feeling like my entire face was on fire. With both eyes still swollen shut and feeling like I had flames shooting out of my face, I “felt” my way into the living room to grab for the phone. I didn’t like that vase anyway, it was old! I “felt” the numbers on the handset of the phone and actually reached the doctors office on my first try. Embarrassed at what I had done, I told the nurse about my little mishap and she just laughed. She told me to take 2 spoonfuls of Benadryl. Said Benadryl is good for any “skin irritation”. So, I hang up the phone, make my way to the medicine drawer and start grabbing bottles on the left, front side of the drawer. I grabbed a triangular bottle…okay, this must be Ny-Quil I said to myself. I put it down and grabbed another bottle. This one was flat and tall…okay, this one has to be the Delsum. My third attempt I grabbed a small round bottle. BINGO!!! This had to be it. Not being able to stand the pain a minute longer, I just opened the bottle and started swigging what I thought might equal 2 spoonfuls and praying real hard that I had the right stuff. Within about 2 minutes, the burning pain left my face and within around 20-30 minutes, I could open my eyes and see again. Needless to say, I gave up doing the pepper thing that year. Thanks for this post, Laura. I just came across your website last week and happened to read this post. Yesterday I touched a dish that my husband had touched after cutting jalapeno peppers and then rubbed my eye. It was extremely painful, but thankfully I remembered this post and the milk worked wonderfully!! Thanks again! Thanks so much for this post. I just had jalepeno eye! Your blog saved me much pain! I did one little variation … I put my milk on a paper towel then held it to my eye. thanks again! Thank God for this post. I cut up some jalapenos just now and accidentally touched the inside of my nose while I was blowing it. I put some milk on a tissue and held it up to my nose. We only have two percent milk, but it did help! THANK YOU! You just save my eyeball from further pain!!! I am now, too, left with milk all over the place, my eye, face, hair… floor :) I don’t care, the burning stopped. Ahhhhhhh! RELIEF! Thank you! I was being impatient today and chopped a jalapeno bare handed… but I washed my hands real good… so I thought. I touched my lip and eye- which were instantly set ablaze… As my wonerful hubby was laughing at me he asked, “in all your homemaking/homesteading blogs hasn’t someone told you what to do in this situation” And I thought- thankyouverymuch, they have! R E L I E F! THANK YOU!!! My 7 year old daughter just found a left over pepper in our garden and rubbed her eyes. Instant screaming and tears followed, much like you describe above. Cold water was not doing it but as my wife flushed her eyes I found your milk trick. Huge instant relief. We even just poured a big bowl and she dunked her whole face in it. I do appreciate your sharing and the cookie idea is going to follow for us too. Thanks again. For those who haven’t thought ahead to use gloves, you can use the plastic bag that holds the peppers if you buy them at the grocery store. Just hold the peppers through the plastic and turn the bag inside out to the point you need to handle and cut the peppers. Sadly, the store I went to yesterday had the peppers in a tray, so I had to handle them, bare-handed. I thought I was okay, this morning… I’d washed my hands a couple of times since then, but even now, it stings a bit. I read that you can wash your hands in vegetable oil first, then with soap, and that should take care of pepper oil on your hands. Good luck, folks! I just experienced my 2 year old grandson that grabbed a pepper off of the counter and rubbed his eyes. We tried to rinse his eyes with water. It was so bad that I googled remedies for hot pepper in the eyes. That’s when I came across this website to wash out the eyes with milk. It sure did work..I was truly amazed. Thanks for such a wonder tip. My story is about my mom, she accidently touch her eye after cutting the hot peppers. My mom couldn’t open her eye and felt nothing but pain. I did try water and soap but it just made it worse. So i went online to see what can ease her pain. And believe it or not the milk work. No more pain. My mom eye did get swollen but the ice helped. I guess everyone learns their lesson when things happen when you least expect it. Just used this for my 2 year old. He’s fine now! Thanks! OMG !!! My son decided to help his mother make dinner! Bad idea to rub his eyes after cutting the hot peppers. Thanks to ur helpful remedy it saved us a trip to the ER! Thank you!! My 10 year old just came in the house screaming that her eyes were burning and we couldn’t figure out why. I remembered she had been holding Jalapeno’s from the garden earlier and she must have rubbed her eyes. I used your milk therapy and it seems to be working. Google rocks! Thank you! Let me start by saying thank god for this web site n remedy ! After cutting and cleaning hot peppers i deposited the caps and seeds in the trash and tied the bag closed at which time my 7 yr old son asked if he could take out the trash to earn money for a ds game he has been saving for. I said sure . He did so and when he returned began jumping around saying his eye was hurting. I asked if he fell or something hit him in the eye. He said no it burns! I realiized pepper oils transfered from my hannds to the trash bag to his hannds. He then touched his face and rubbed his eye. Not really sur,,e what to do my instinct was to flush with water. At first this brought a little relief to my son but soon he began screaming its getting worse! Frantic now i googled remedies for hot pepper in eye,which led me to this site and remedy which said take a shot glass of whole milk, hold the eye and blink flooding the eye with the milk. Sounds great until u try to get a screaming 7yr mexican jumping bean to stand still to do it! Desperately frantic as his screams turned to violent shrieks of pain and his fair skin turned cherry red, i put him in the bath tub, turned on cool water,and with a half gallon of milk began pouring it over his face while telling him to blink. To my amazement he instantly began to feel better. Voila! The pain is gone and sponge bob is now king of the night. After years of handling hot peppers w/o incident, I just got serrano pepper oil in my eye. My first thought was milk, because it’s my understanding that when you eat hot peppers, milk or bread neutralizes the heat. I wonder if it would work to soak bread in milk and apply it to the eyes? Might be easier for children, if it works. i just cut up sum jalapenos and i rubbed my eye not knowing i had to use a glove. it started with a lil burn in my eye and i laughed, then like 2 seconds my whole face turned red and i was going crazy… i poured water in my eye n i think it made it worse, alot worse. i put a fan in my face and it helped very little. and my wife found this and she came upstairs and threw the shot glass at my face…the glass to my face really hurt but the burning went away… Thanks!!!! Thanks for this article. Saved my wife tonight. And another rescue story to add to the list. My wife, after making a delicious batch of cheese-stuffed jalopenos, rubbed her eye. She went running off for an water eye bath, which didn’t help, but the milk solution found here gave her immediate relief! Thanks for your post! wow! oh what would we do without google! this works! wow!!! we used a plastic medicine drinking cup, one of those small ones. this works. Same thing happened to me. I googled it, came across this and just started reading. My pain went away gradually. No milk no cookies. Thanks. I almost wet myself laughing so hard. I love your humor and descriptions. Although I’ve never done this myself, I can see it happening. Sorry to laugh at your pain. Thanks for the post. Wish I had read this yesterday!!!!! Thank you for the hilarious read. I’m in awe of how many people you’ve helped by posting your story on the internet. 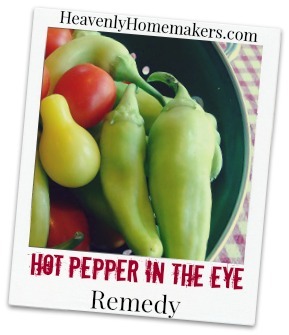 As a mom, teacher, and grandmother I’m glad to know no about this remedy for hot peppers in the eyes. On behalf of my wife, whose story sounds remarkably like yours (your description of the shriek and run in a circle was SPOT on) thanks you immensely, and vows wonderful cookies tomorrow! Thank you, and also thanks for the laughs to help bring us down after our psycho crisis. Please put answer at the top next time. Lovely story but it was hard to read with Jalapeno in my eye. Have to agree with the above– haha, so hard to scan the article to find the answer with jalapeno in my eyes and no one else at home! Helped immediately though once I did! OMG thanks for your recommendation for milk…..didn’t have any….went to neighbor…put milk….little relief…after a few doses of milk in eyes…..moved on to ice ont he ice…finally i could open my eyes….still burning but I can see….thanks…as I read all this I’m kind of glad others have experienced the same symptom……glad it is short lived. So I got pepper juice in my eye tonight and I saw this post and tried the milk thing…it helped a little for me but my whole face and eye were still burning after several flushes so in my desperate state I grabbed some french onion dip from the fridge and slathered it on my eyelid and side of my face that was burning and that instantly helped! so if you dont have milk, see if you have any sourcream dip or ranch dressing might work too. Thank you so much! My husband decided to wake up early this morning to make me a surprise omelet breakfast. He cut up some hot peppers, and after he finished cutting them, he barely touched his eye. He apparently rushed to the bathroom and tried washing his eyes out with soap and water (all while I was still asleep in the bedroom unaware of what was transpiring in the kitchen) When I woke up and noticed that my dear hubby was missing from bed, and it was still before the alarm was set to go off, I looked out in the kitchen to notice that he was rubbing his eyes with ice cubes. I asked him what was going on, and when he told me, I instructed him to sit down, and hold the ice cubes on his eyes long enough for me to look online to find a remedy. I found this page. I immediately took some of our whole milk from the fridge and flushed his eyes out with it. It worked almost instantly! His eyes went from hardly being able to open at all to clear not bloodshot again! Thank you so much! Thanks for posting this remedy. I was just taking the seeds out of some jalapenos and wouldn’t you know it, got to the last pepper and it squirted me right in the eye. I instantly went to the sink and tried washing it out (didn’t work). Had to suffer through the pain until I came across your remedy. Thanks again!! You know that putting milk on a towel and applying it to your eye works too, right? No need to make an ugly mess. My husband just got jalapeño juice in his eye & face. We don’t drink milk so we couldn’t use that. However, we realized that coffee is highly acidic and could possibly be used as an alternative combatent to the attacking jalapeño juice sting. It worked instantly! So, for all those non-milk drinkers, coffee (cold of course!) works too! I just accidentally rubbed my eye after chopping up a Jalapeno pepper for chili. This remedy worked like a charm. I also rubbed sour cream around my eye as the skin felt like it was on fire. I can see! Thanks – you just saved my wife from lots of pain! Turns out MooTopia works, too. :-) My fiancee just got Serrano pepper in her eye, and a quick Google search came to this site.. of course we don’t drink milk. Haha.. anyway, situation averted. Thanks for this article! I’ll vouch for this idea. Along the same line, I make a practice of washing my hands with milk after I’ve handled peppers, even with gloves. (A couple of bad experiences have left me extra-cautious.) I just pour about a tablespoon into my hand over the sink, rub and rinse, then wash with soap and water if needed. Whew! We are so glad to have found this article when my wife touched her eye after chopping a Jalapeno. She thought she had washed up, but that didn’t stop it. Thanks for your tips and humor to help the situation!!! Godspeed. Thank you so much! I was ready to make my wife drive me to the ER. That pain was rediculous! Great story and help. My only complaint is I had to resort to someone else’s link first as I was in dire pain and did not have time to read your story……..HOWEVER, once I was done, I HAD to come back and read your story. Quite entertaining! Just did it myself. With one eye squinting I googled and found your post first. Grabbed the milk and VOILA! Pain all gone. THANK YOU! Oh holy geez! I know not to touch my eyes, but I totally forgot and did it…OUCH! Thank goodness I found this and had heavy cream and used that. I didn’t even care that I had a big wad of paper towels wadded up and stuck to my face. Thanks for posting this. it works I have just done it when powdered pepper entered my eye. I know this is an old post but had to chime in to thank you! My four-year-old just picked jalapenos from our garden and rubbed her eyes. WOW. Major pain, many tears, and her little face was so red! Unfortunately she is also allergic to something in milk so I had to tell her to shut her mouth tight, tight in case milk ran down her face and into her mouth but this cured her eye pain almost immediately! This happened to my six-year-old son in a restaurant. Apparently the table hadn’t been wiped completely clean after the previous diners. He managed to find the piece of hot pepper left on the table then rubbed his eye. Many tears of pain and many trips to the restroom to try to flush out the eye brought a little relief. Finally one of the waitresses remembered an emergency eye wash kit in the kitchen. You are soooo funny! I have done the pepper in the eye, lips, etc. thing also, but didn’t know about the milk trick at the time. I will certainly remember it if it should happen again. Good advice here, had not heard this, but will keep it in mind if I ever need to use it….. This is super funny and helpful! Thanks!!! I had a similiar incident. I accidentally squirted jalapeno juice into one eye, and tried to wash that eye out under a tap. Unfortunately, the water picked up the heat, and ran into my other eye which left me unable to see. Thankfully, my husband was home. The only thing I knew to use was sour cream. I sat in a chair for about 10 minutes with sour cream wadded in both eyes, but it was a beautiful relief. My pharmacist recommended a daily dose of polysporin in the eyes for a few days because of the bacteria in sour cream, and to use tear drops because my tear ducts were burnt. My tear ducts returned to normal in about a week. But I’m so glad that I used sour cream. I think if I would have went to the ER, they wouldn’t have used any dairy products, and I probably would have ended up with damage to my eyes. My husband thanks you for this eye-saving advice!! However, he disagrees with the making cookies part.. bummer!! At least he helped make the salsa, and his eye is all better! I posted this in both my personal FB page and my photo page. Thought you’d like to read it! And THANK YOU! hope your readers enjoy it. About an hour ago wanting to spice up what would otherwise be bland poached swordfish, I chopped up some herbs, chopped up 4 different Mexican hot peppers, and not content with the sliced hot peppers , I ground up (mashed) pepper seeds along with the fresh garlic in a mortar and pestle. I tasted the mix (which made my lips sore and my nose run and figuring it would be fine I started cooking the fish. Just now while posting a photo on my nariophotos FB page ( https://www.facebook.com/nariophotoscom ) , I rubbed my left eye (it was itching) and voila’ ! – apparently I still had hot pepper on my finger… even after washing my hands! It so worked! Ive been making chili for years.. Wearing gloves when I cut my onions, peppers and garlic. But today, Not so much!! THANK YOU! THANK YOU! THANK YOU! Thank You!!!!! I thought I ruined my night. Couldn’t see a thing. Tried eyedrops… no relief. Until I used a shotglass of milk! Thank you! I did the Eyeball Fire Ballet. I did the cool rag. I did the search with one blurry eye, and your post came up first. I ran to the kitchen and used my not so whole milk and instantly my eye felt better. I have rubbed my eyes before but never like this. Wow, I didn’t know it could hurt that bad. Thanks again! My husband wants to thank you!! We were standing taking and similar to you had washed his hands and then rubbed his eye. He was trying to be composed and did a pretty good job. I picked up his phone and you were the top hit. The milk worked like a charm!! Thank you. Thank you! Thank you! Thank you! My wife just did the same thing and you save her with this post. My incident happened at a Vietnamese Restaurant. I used my fingers to get jalapeño bits in my Pho soup, started eating, eye was itchy then HHOOLLYYYY HELL THE PAIN!! I wanted to curse and do the Eyeball Fire Ballet but I was in a public place with faces already turning to see what was going on. All I could do was clasp my hands to my eye and think ‘that’s it… This is the day I go blind in my left eye… From Pho soup of all things’ I made a beeline for the Bathroom where I drenched my eye in cold water and cursed under my breath. My eye was so red it looked like one of those contact lenses for Halloween. Way to ruin a Friday night…. I wish I had the ability to resort to this magical information to use milk; I will know for the future now since, knowing me, I’ll be bound to do this again someday. Thank you very much, that burned like no other! Very new to Jalapeños . I’m just very glad the first one on Google seach; I clicked on worked, thank you very much! Yes, Gloves is a must! I wish I’d known sooner there was a cure for this! I can’t tell you how many times I’ve cut jalapenos or something and then thoughtlessly rubbed my eyes… I thought I just had to wait it out, so that’s what I did. Never would’ve thought of using milk on it.